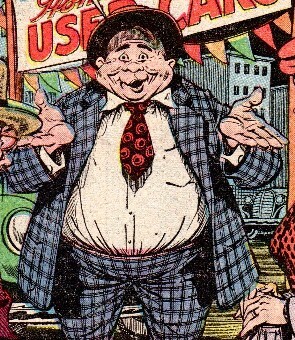 Powers/Abilities: A normal human, "Honest Ernest" was a greedy and unethical businessman who owned a used-car lot. The shifty, smooth-talking salesman had a knack for getting the better end of a business transaction; in one such deal, he acquired a mysterious car that transported him to another dimension. (Marvel Tales I#131/1) - An elderly couple went to "Honest Ernest's Used Cars" to purchase an automobile. Ernest sold them a car, and when the faulty brakes failed, the glib salesman was able to absolve himself of any responsibility in the resultant accident by convincing the senior citizens that they just didn't know how to use the brakes properly. Shortly afterward, Ernest was approached by another customer--a strange little bald man. The man wanted to buy a car, and he only had $100, so Ernest suggested that he trade in his old car. But when Ernest saw the man's car, he was stunned by its futuristic design, the like of which he'd never seen before. The unscrupulous wheeler-dealer was determined to get that car--he figured it was easily worth at least $4,000--so he offered the stranger $200 and one of the cars off his lot. Initially, the little man was reluctant to take the offer because he said his old car was worthless, but Ernest talked him into the deal. After the strange man drove away with his new automobile, Ernest went over to the unusual car. He decided to keep it for himself, so he climbed in and started the engine. Suddenly, the street faded away and Ernest found himself on another world--he'd read enough science-fiction magazines to figure out the car had taken him to another dimension. He got out of the car and began to explore the barren planet. He found gold nuggets that seemed to grow from the ground like grass, so he gathered as much gold as he could fit in the car, then started the engine and "drove" home to his car lot. But the avaricious Ernest wanted more of the precious metal, so he grabbed some burlap sacks, started the car's engine, and went back to the strange world. Ernest scooped gold dust until his knuckles were raw, then he noticed a horde of monstrous creatures surrounding him... and worse, they looked hungry! It seemed like a good time to return to the safety of home, so Ernest took the sack of gold and ran to the car. 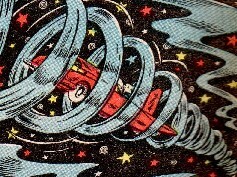 But when he started the vehicle, the engine sputtered and died, and Ernest was stranded in the hostile alien dimension. As the ravenous monsters began to close in on him, "Honest Ernest" finally realized why the little man had parted with the amazing automobile: The car was a "lemon"! Comments: Created by an uncredited writer and Bill Everett (artist). Ernest's last name was never revealed, so I'll suggest "Hunnicut" (...which was the name of a dishonest used-car salesman on an episode of the old Twilight Zone TV series (for details, see HERE)). 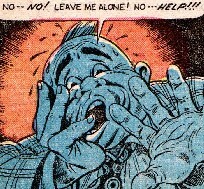 The origins of the strange man and the mysterious car are unknown, but I'll speculate they had some connection to those extradimensional aliens that Earl Rawls encountered. And a BIG Thank You to Atlas Tales for the scans!. They inhabited a barren planet in an unknown dimension. 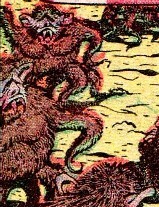 Numbering at least eight, these hairy creatures had ape-like upper-bodies and tentacled limbs on their lower-bodies. Possibly carnivorous, the hirsute horrors surrounded "Honest Ernest" after he transported himself to their world in a dimension-traveling car. A motor vehicle of advanced design, it could travel across dimensions. It was owned by a strange little bald man, who traded it to "Honest Ernest" for a conventional automobile. Ernest later used the unusual vehicle to transport himself to another dimension, but he was stranded there when the car broke down. The origins of the mysterious car and the strange man are unknown (see comments).